1KP "Dnipropetrovsk Regional Clinical Hospital named after I.I. Mechnikov"
Summary. The article is devoted to the problem of the nervous system damage in diabetes mellitus. The prevalence of diabetic polyneuropathies is presented. The attention of practical doctors is emphasized on the features of the course of rare forms of diabetic neuropathies, in particular thoracoabdominal neuropathy. The crucial aspects of this investigation are symptomatology, course, diagnosis, differential diagnosis with the internal organs pathology. Development and treatment of one clinical case of the patient with thoracoabdominal neuropathy with combined disorders in the emotional-volitional sphere are described. Barkanova O.V. (2009) Metodiki diagnostiki emotsionalnoy sferyi Psihologicheskiy praktikum. Litera-print, Krasnoyarsk, 237 s.
Kamchatnov P.R., Chugunov A.V., Evzelman M.A. (2016) Porazhenie perifericheskoy nervnoy sistemyi pri saharnom diabete. myish. bol., 6(2): 20–26. Morozova O.G. (2009) Polineyropatii v somaticheskoy praktike. Nov. med. farmats., 20(300): 10–12. Pankiv V.I. 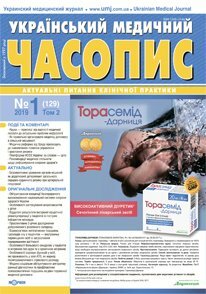 (2013) Tsukrovyi diabet: vyznachennia, klasyfikatsiia, epidemiolohiia, faktory ryzyku. Mizhnar. nevrol. zhurn., 7(55): 95–104. Sakovets T.G., Bogdanov E.I. (2013) Bolevyie neyropatii: etiologiya, patogenez, klinicheskie proyavleniya. Akt. probl. med., 1–2(69): 96–100. Smulevich A.B. (2000) Depressii v obschemeditsinskoy praktike. Bereg, Moskva, 160 s.
Argoff Ch.E., Cole B.E., Fishbain D.A., Irving G.A. (2006) Diabetic Peripheral Neuropathic Pain: Clinical and Quality-of-Life Issues. Mayo Clin. Proc., 81(4): 3–11. Davies M., Brophy S., Williams R., Taylor A. (2006) The prevalence, severity, and impact of painful diabetic peripheral neuropathy in type 2 diabetes. Diabetes Care, 29(7): 1518–1522. Gore M., Brandenburg N.A., Dukes E. et al. (2005) Pain severity in diabetic peripheral neuropathy is associated with patient functioning, symptom levels of anxiety and depression, and sleep. J. Pain Symptom Manage, 30(4): 374–385. Jamesson J.L., De Groot L.J. (2016) Endocrinology: Adult and Pediatric. 7th ed., Vol. 1. Elsevier, Amsterdam, 2704 p.
Mallison R., Tilke C., Brasser M., Pittrow D. (2007) Efficacy and tolerability of pregabalin in patients with neuropathic pain. Observational study under clinical practice conditions. MMW Fortschr. Med., 149(14): 46. Sadosky A., Schaefer C., Mann R. et al. (2013) Burden of illness associated with painful diabetic peripheral neuropathy among adults seeking treatment in the US: results from a retrospective chart review and cross-sectional survey. Diabetes Metab. Syndr. Obes., 6: 79–92. Thomas P.K. (1999) Diabetic peripheral neuropathies: their cost to patient and society and the value of knowledge of risk factors for development of interventions. Eur. Neurol., 41(1): 35–43. WHO (2016) Global report on diabetes (http://www.who.int/diabetes/global-report/en/).